Father's Day is just around the corner. 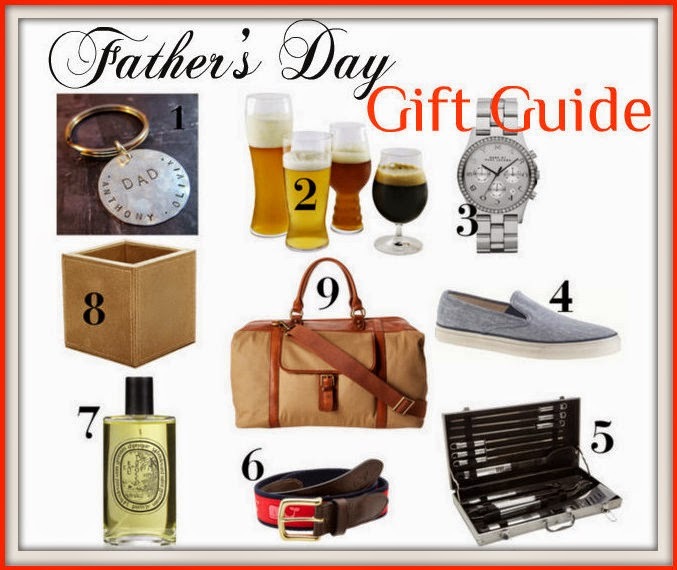 Whether dad's an old-fashioned guy or a modern one, my gift guide offers something for all the fathers and father figures in your lives. 1. I love this personalized key chain. Not only does it say Dad on it, but you can add the names of children or grandchildren too. 2. Treat dad to a subscription to the Beer of the Month Club. 3. Keep dad punctual with a Marc by Marc Jacobs watch. 4. Dad will step out in style in Sperry Top-Sider slip-on sneakers. 5. Dad can cook up some grilled goodies with a barbecue tool set. 6. Finish off dad's dapper look with a belt from Vineyard Vines. 7. Dad will love the fruity, masculine scent of this cologne from Diptyque. 8. Give dad a stylish place for his pens and pencils on his desktop with a leather holder. 9. Send dad off for a weekend of relaxation in style with a casual yet cool duffle bag.